Ersta Sköndal University College is dedicated to studies in the fields of social work, nursing and health care, psychotherapy, theology and church music with an explicit ethical and diaconal orientation. It was established in 1998 through the merger of the undergraduate, post-graduate and research programmes of the Ersta Society for Diaconal Work and The Stora Sköndal Foundation. A distinguishing characteristic of the University College is that it offers courses in which theory is combined with practice, research with studies in the field, and that special attention is given to questions within philosophies of life and world views, professionalization and societal issues. The University College has three campuses, one at Ersta, one at Stora Sköndal and one att Bräcke in Gothenburg, with a total of approximately 1400 students. The Department of Social Sciences – located at the Sköndal Campus – is mainly involved in the training of social workers for work in public, private as well as non-profit organisations, but is also promoting research witin the field of Social Work, in order to enhance scientific knowledge in human change processes, on the individual, community and structural levels. The Department of Social Sciences has initiated a Linnaeus Palme Exchange Programme with Loyola College of Social Sciences (LCSS) in Thiruvananthapuram, Kerala, India. LCSS was founded by the Society of Jesus (Jesuits) in 1963, the College offers courses in M A (Sociology), MSW (Masters in Social Work) and MAPM (Masters in Personnel Management). 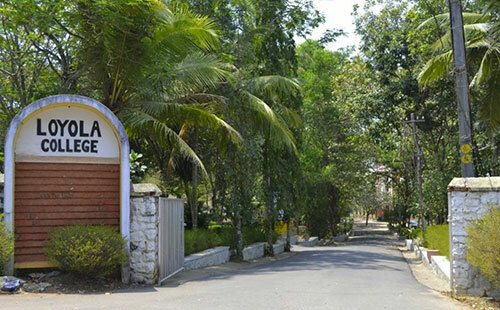 The College is affiliated to the University of Kerala and is a recognized research centre of the University. In mid-March 2013, the Swedish International Programme Office for Education and Training decided upon the thirteenth round of Linnaeus Palme Exchange Programme grants, for the period 1 July 2013 – 30 June 2014. Ersta Sköndal University College was one of the successful applicants, and was awarded SEK 60 000 to launch the collaborative exchange of teachers and students with Loyola College. The contact person on the Indian side is James Joye, Director for Loyola College of Social Sciences. The project continues, and was awarded SEK 60 071 for the project period 2015-2016. More information about South Asia related Linnaeus Palme programme grants for 2015-16. Johan Gärde, who has a PhD Sociology of Religion from Uppsala University, and work experiences from American University of Beirut, and Notre Dame University-Louaize in Lebanon (more information about Johan) has been in contact with key persons at LCSS since 2011 with an ambition to establish collaboration. Students from Ersta have been sent to LCSS on Minor Field Studies scholarships, and they have been given good assistance, because of LCSS excellent field contacts in various social projects, and the interesting research and teaching carried out – similar to what is being practiced at Ersta. The project will start on a small scale from the fall semester 2013, with a guest teacher coming from Loyola to Ersta, and also Johan Gärde and the Dean of the Dept. of Social Sciences, Ersta, going to Thiruvananthapuram in order to plan for further collaboration. From the spring 2014, an exchange of students will be launched, and the ambition is to invite one teacher and two students from Loyola to participate in the planning for a new ambitious global course, based upon interesting social projects worldwide and with guest teachers from many countries, that is planned to be introduced at Ersta in the fall 2014. As part of its Masters programme in Social Work, the department plans to introduce a new 7.5 credits course entitled ”Global Social Issues in a Comparative Perspective” from the fall semester 2014. The Masters programme, run in English, is expected to have 15–20 participants, from Sweden but also from several European and Asian countries. The Loyola teacher and students should be among them.